An unmanned robotic yacht has been launched off the Irish coast as part of a transatlantic challenge, although it is not expected to complete it. Pinta is 3m long and was built by scientists at Aberystwyth University, who have carried out sea trials and taken part in competitions since 2006. But this is the first time their boat has attempted the Microtransat Challenge ocean crossing. Aberystwyth is the only team competing in this year's challenge. It was conceived by academics in Aberystwyth and Toulouse, France. Teams from around the world, who have taken part in previous years, have used on-board sensors and GPS technology to help their boats sail themselves from courses set by computer. Dr Mark Neal, one of the founders of the challenge from Aberystwyth University, said the aim was to build robots that could survive in hostile environments for long periods. But he said he did not expect his boat, Pinta, to succeed. He added: "We're the only team taking part this year." A team from Brest in France (Breizh Spirit from ENSIETA) pulled out at the last minute partly because of the weather conditions. "I don't think Pinta will succeed because there are some horrible weather conditions out there. There are 35 to 40 knot winds and the remnants of a hurricane. "It will probably capsize. It is waterproof, but it won't survive the continual flipping over. "At this point it could well turn out to be the world's first robotic sailing boat shipwreck." Dr Neal, who has been helped by Phd student Colin Sauze, said Pinta was crafted from a child's dinghy and "second-hand and cheap parts". Complete with small solar panels, the boat can be programmed to sail the course of a race but must be propelled by just the wind. 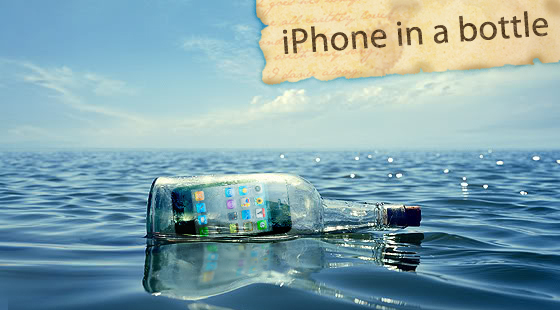 They want to put an iPhone in a bottle and throw it out to sea. It will take photos and upload them on iphoneinabottle.com for everyone to see! All our supporters will have the chance to put their name inside the "bottle" and become part of this unique event. They were inspired last year to do this after a student sent a camera to space using a weather balloon. They want to follow the same concept but with a twist. The difference is that they will send two iPhone 4's, but not to space. They will send them out to sea! The iPhone will be in a custom made "bottle". They will throw it in the sea and wait for it to reach shore in another country. But they will not just sit and wait. 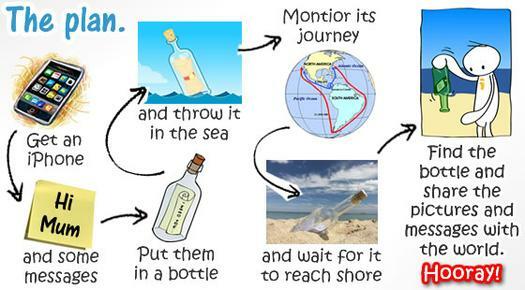 They will design a system with which we can monitor the position of the "bottle" using GPS trackers. They will also program the iPhones to take random photos during its journey, and whenever there is GPRS or 3G reception it will upload the photos to the project's website. They will place 2 iPhones in the bottle. One will be "Sea View" and will face forward, capturing images of the sea and hopefully some ships and land ahead. The other will be "Fish View" and it will be facing downwards, hopefully capturing images of some fish which come to eat off the bottle. Everything will be powered by solar chargers so as to keep the system working (indefinitely I hope). They will track the position live using a GPS tracker which has worldwide signal, and the journey will be plotted on a map and shown on the website in realtime. They will also build an iPhone application which anyone can download for free and watch the "bottle's" journey. How turning off the tracking feature on the iPhone/iPad application? Do you know if there is a way to reset the red tracking line? Actually the app starts tracking when the GPS signal is received. The only way is to quit and relaunch the application. tap and hold icon in multitasking bar for a second or two until it starts to jiggle : you'll see a little minus badge in top left corner. now, you just click that "minus" and app is "really closed"
Film about the Phoenix Islands Protected Area, Republic of Kiribati. Kiribati, a small nation consisting of 33 Pacific island atolls, is forecast to be among the first countries swamped by rising sea levels. Nevertheless, the country recently made an astounding commitment: it closed over 150,000 square miles of its territory to fishing, an activity that accounts for nearly half the government's tax revenue. What moved the tiny country to take this monumental action? President Anote Tong, says Kiribati ("Kir-ee-bas") is sending a message to the world: "We need to make sacrifices to provide a future for our children and grandchildren." President Tong isn't mincing his words. Kiribati looks to make the ultimate sacrifice by mid-century, when much of the country is projected to be largely uninhabitable. Rising seas will contaminate freshwater supplies, ruin agriculture lands, and erode beaches and villages, forcing its people to flee. Kiribati has done nothing to earn this fate—its greenhouse gas emissions are negligible and its population barely tops 100,000. Yet it is already looking at buying land in other countries for eventual resettlement of a substantial proportion of its population. Kiribati is among the world's poorest countries. It has few natural resources other than fish and copra, the dried meat of coconut. PIPA is part of President Tong's bigger, more ambitious initiative, the Pacific Oceanscape—38.5 million square kilometers (24 million square miles) of ocean, an area larger than the land territories of the United States, Canada and Mexico combined. Over the past two years, President Tong has brought together 16 Pacific Ocean nations to develop the initiative, which seeks to maintain ocean health by improving management of fisheries, protecting and conserving biodiversity, furthering scientific understanding of the marine ecosystem, and reducing the negative impacts of human activities. President Tong's efforts in the face of incredible adversity has earned him considerable respect in the conservation world. Dr. Greg Stone, Chief Ocean Scientist and Senior Vice President for Marine Conservation at Conservation International, likens him to the "Teddy Roosevelt of Oceans" in that President Tong is doing for oceans what the 26th president did for land conservation in the United States around the turn of the 20th century. "What we are seeing here is the dawning of a new era for marine management," he said. President Tong brought his message to San Francisco last week for the California and the World Ocean 2010 conference. Presenting along side U.S. Representative Sam Farr (Dem-CA), NOAA Administrator Jane Lubchenco, philanthropist David Rockefeller Jr., oceanographer Sylvia Earle, and hundreds of marine scientists and conservationists, President Tong urged the world to take action to protect oceans and avoid climate change. "There is obviously a need to consolidate all of the efforts in ocean governance in the Pacific and indeed in the world if we are to successfully manage and conserve these resources for present and future generations," he said. Following his keynote address at the conference, President Tong discussed climate change and marine conservation with Mongabay.com's Rhett Butler (see the article of Mongabay, a short excerpt of the interview with President Tong). Within the space of a week two ships have been involved in accidents in the Northwest Passage, fuelling debate on the environmental risks associated with shipping north of the Arctic Circle, despite the waters being increasingly ice-free in the summer. Both accidents were blamed on navigation problems, drawing attention to a lack of proper charts for the region. In late August the cruise ship Clipper Adventurer was heading for Kugluktuk, at the entrance to the passage, when it struck a rock not shown on the map, according to the captain of the ship. The Canadian Coast Guard sent an icebreaker to rescue the 110 passengers, taking them to the ship's next port of call. The condition of the ship – still stuck but said to be "stable" by CCG spokeswoman Chantal Guénette – is being closely watched until it can be refloated. The MV Nanny, a small Canadian oil tanker, suffered a similar fate on 1 September, running aground on a sandbank in the western part of the passage. Here again a CCG icebreaker soon reached the ship, which was carrying 9m litres of diesel fuel for remote Nunavut communities. An inspection of the vessel confirmed that "no damage has been detected and there are no leaks", said Guénette. The ship's master also blamed the grounding on inaccurate charts. Louis Fortier, the scientific director of ArcticNet, the main network of Canadian researchers working in the Arctic, is not surprised at the accidents. "Only a tenth of the region is properly mapped," he said. Dale Nicholson, the head of the Arctic region at Canada's Hydrographic Service, confirmed this figure. He reckons there is no need to map the whole of the Canadian Arctic for it to be possible to navigate the main channels "but we obviously need more than 10%". Highly specialised, relatively expensive equipment is required to map the seabed. The Hydrographic Service lacks the financial resources to speed up the process, yet time is running out, says Fortier. "Between 1906 – when the Norwegian explorer Roald Amundsen first negotiated the passage – and 2009, 69 ships took this route. This year, in only seven months, 24 ships have already passed through and most of them are cruise ships. If we want to prevent a rash of accidents, we must make mapping the Arctic a priority," he said. But it is impossible to control everything. Cruise ships sail too close to the land to give passengers a better view, straying from the properly charted central channel. In a revamp of the world's oldest international sporting competition, the next America's Cup regatta, in 2013, will use "cutting-edge" catamarans instead of the traditional monohulls. The new "action-packed" format for the event is designed to appeal to "the Facebook generation, not the Flintstone generation," Russell Coutts, the CEO of America's Cup defenders Oracle, told a news conference here on Monday. The 72-foot (22-metre) wing-sail catamarans will be "pretty special, very powerful and very demanding," the four-time America's Cup winning New Zealander added. America's Cup regattas traditionally use the much larger monohulls. But the last edition, held in the Spanish Mediterranean port of Valencia in February, was a best-of-three multihull duel between the US syndicate Oracle and Switzerland's defending champion Alinghi. That match, won by Oracle, was the result of more than two years of legal wrangling between the two teams -- owned respectively by US software tycoon Larry Ellison and Swiss biotech billionaire Ernesto Bertarelli -- which many felt had tarnished the sport's image. Coutts said in planning the new-look 34th edition of the Cup, the organisers "looked beyond sailing" and talked to leaders of NBA basketball, Nascar and Formula One auto racing and European Champions League football. In June, organisers carried out tests off the coast of Valencia involving multihulls and monohulls to see what works best for television audiences. Coutts said the AC72 catamarans, which can zip round the racecourse with one hull in the air, will "produce great match-racing" and "open the door to other teams from elsewhere in sailing who have never contemplated the America's Cup before". They will "reconnect the America's Cup with young sailors and encourage a new larger audience to turn on and tune in," he said, adding that many of the potential challengers "see it as a chance to level the playing field". Pete Melvin, a champion multihull sailor, said the new catamarans will produce "competitive, fast high-adrenaline racing, creating a more exciting competition". As part of the overhaul of yachting's premier event, which dates back to 1851, Coutts also announced that a "new annual America's Cup World Series.., featuring the cutting-edge catamaran, will deliver exciting racing to new audiences" from 2011. He also said a new "Youth America's Cup" will take place from 2012 and "media output will be revolutionised" with "on-board cameramen". The regatta itself will feature a "shorter action-packed race format" and 11 crewmen per yacht, six fewer than in the monohulls. "We need to capture and communicate the excitement that our sport can produce," Coutts said. "We could have pressed the repeat button and organised the 34th America's Cup much the same" as the 32rd America's Cup, held in Valencia in 2007, the last edition of the event to follow the traditional, multichallenger format. "Then, the boats were relatively even and some of the racing was great. Even so, when we looked into it deeply, the commercial and media returns fell well short of a coherent and cohesive model that would create sustainable teams and encourage sponsors to plan for the long term." He said limits on the numbers of boats, sails and equipment will also bring down costs for the competitors. Coutts, one of the world's most successful sailors, said Oracle would announce the host city for the 34th edition by the end of the year. San Francisco, where Oracle is based, is widely seen as the preferred venue, but Valencia and a port near Rome as well as a site in the Middle East have also been cited in press reports as possibilities. He also confirmed that the protocol for the next edition envisages an "independent body that will run the competition", the America's Cup Race Management. This "international jury" will have "wide-ranging powers" and "will quickly end any of the show-stopping disputes that we have seen in the past," he said, referring to Oracle's legal battle with Alinghi. The official race protocol for the 34th America's Cup was signed Monday by Oracle and Italian syndicate Mascalzone Latino, the official "challenger of record", which has the right to help organise the event. He has commissioned Australian engineers to build a deep sea submersible which can reach the bottom of the Mariana Trench - 36,000ft (10.9km) down in the western Pacific (Marine GeoGarage position)- after deciding to set the film in the turbulent waters of Pandora, an alien moon. In the cold and darkness, eating chocolate bars, they were joined by flounder, sole and shrimp, proving that some vertebrate life can exist at such extraordinary depths. Although remote-controlled vessels have gone back to the Challenger Deep, a valley at the bottom of the trench, no humans have been so deep again. However, Cameron, who reportedly earned $US350 million ($377.84m) from Avatar, has the money and passion to return. His obsession with the waters that cover two-thirds of the world’s surface has been manifested not only in his blockbuster Titanic and a spin-off documentary, but also in his 1989 film The Abyss. Cameron told Russian journalists that he had come to the Siberian lake to draw attention to its pollution problems. He says his descent into the Mariana Trench would be a similar environmental mission. “We are building a vehicle to do the dive,” he said. He hopes to start preparing for the dive later this year. Australian scientists believed to be working for Cameron have visited the San Francisco headquarters of Hawkes Ocean Technologies, which has been building a submersible capable of settling at the bottom of the trench. Cameron’s new vessel is expected to be a two-seater, finned cylinder fitted with the latest 3D cameras and a heating system largely missing from the Trieste. Some of his footage from the depths may end up in Avatar 2 - which is not expected to reach cinemas before 2014 - or possibly in two other deep-sea adventures that the director is considering turning into movies. Later this year the X Prize Foundation will offer at least $10 million (£6 million) for the first privately funded craft to make two repeat visits to the Challenger Deep in the Mariana Trench. The foundation now aims to change deep ocean exploration by inspiring companies to develop technologies that will “significantly increase our ability to explore, gather information, and map the ocean’s depths”. The latest stories throw English Billionaire Richard Branson into the mix, as he has announced his plans at the beginning of the year to reach the bottom of the Mariana Trench using a jetfighter-like submarine being built in the United States. So the director of the two most successful films ever made and the owner of one of the world's most visible airlines are vying for the title of first human in fifty years to dive to the deepest, darkest point in the Mariana Trench all while a third party, the X Prize Foundation, is offering a $10 million prize for whoever gets their not first, but twice. "I wanted to write about the most powerful force in nature through the eyes of the people who understood it the most." One-hundred-foot-tall waves can be nightmarish ship-swallowing monsters — or seductive sirens that tempt the adventurous. But it wasn't until 15 years ago that scientists were even able to prove that such giant rogue waves actually existed. Susan Casey, whose book The Wave tells the story of great waves and those who seek to solve and ride them, says people were skeptical of 100-foot waves because weather patterns don't seem to predict them. Casey says she first became interested in learning about monster waves after hearing a story about the British research vessel Discovery, a 230-meter-long ship that became trapped in a vortex of giant waves for several days. The waves, Casey says, ranged from 60 to 100 feet tall and were not predicted by weather models. "I just wanted to find out more about that, and yet there had been nothing written," she tells NPR's Scott Simon. "So I began to investigate." Casey says that physics principles don't seem to allow for huge waves to exist in certain sea conditions. Yet, "for decades and even centuries, boats had been disappearing, and mariners had said, 'You know, there were these incredibly big waves, and we just escaped,' and nobody believed them." "It was only in 1980 that we got satellites, and it was 15 years after that that it was proved that there are these 100-foot waves that can actually appear in, say, a 38-foot sea," Casey says. "But that made no sense at all." The number of super-large waves is likely on the rise, Casey says, as a result of more climatic extremes, which in turn lead to feistier seas, tougher ocean conditions and bigger storms. The waves form as a result of these large storms, and the inherent instability of the waves — the steepness of the face — lead them to "sort of freaking out and becoming these rogue waves that are very unstable," she says. "They're almost like avalanches of water, where one wave will all of a sudden grab the energy from, say, three or four waves around it and become this teetering monster that doesn't act like a normal wave." 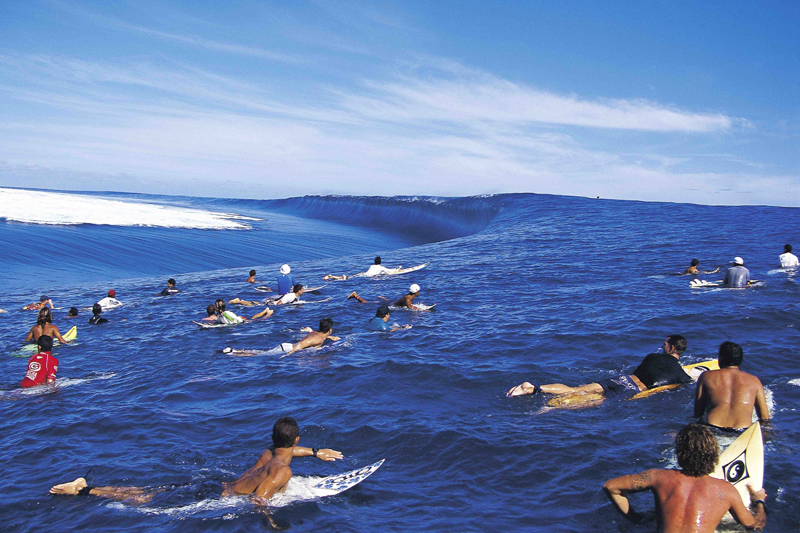 While some people fear these waves, others want to get as close to them as possible. "I was very interested in anybody who had been in a position to tell me more about waves this size," Casey says. She found such people in "a very rarefied group of extreme surfers who seek them out." Chief among them is Laird Hamilton, who invented a special kind of surfing just to tackle these mega waves. At some point, Casey says, the waves move too fast for anyone to be able to paddle into them. "The best waves in the world were going to waste," she said Hamilton once told her. So Hamilton and some surfing friends began tinkering and came up with a technique involving jet skis and water ski ropes that enabled surfers to ride large waves. Hamilton insists he's not nuts: "I would think [I'm] more on the sane side than most of the people that live in cities. And really, I'm doing it — not only because we're able to — but because for us, it's like an exploration. What can we do? How far can we go?" Hamilton says his pursuit of giant waves really has to do with developing a "more intimate" relationship with the ocean. Being in the presence of a giant wave, he says, is to "experience something that is unexperienced by normal man or by any man." Trying to describe the experience of surfing a huge wave is as difficult as trying to describe a color, Hamilton says. "It's something all-consuming. It's an experience that changes who you are. I just feel so alive from doing it. I feel like I get such great power." "It's the moment where you totally relinquish any true control over what you're doing," he says. "There's no place really in life that does it quite like that — when you do fall and you do get hit by [the water], you're just at the mercy of the wave and it dictates. And sometimes those are the most thrilling rides of all. Unfortunately." About 70 percent of the Earth's surface is covered by water, but so little is known about the oceans, Casey says. "This is, to me, the amazing thing: This spectacular force of nature, these rogue waves that can take out an 850-foot ship were, up to 15 years ago, considered not to exist. The most important thing about the ocean is that we explore it. It's our own planet — it's spectacularly beautiful, and it's really, really powerful."